Comparing cumulative per capita emissions since the UNFCCC was adopted in 1992 shows that China has an opportunity for leadership. Such leadership is notably lacking from the USA at the national level and Australia. Under the Paris Agreement each country sets out actions to reduce emissions as Nationally Determined Contributions (NDCs). However, the Agreement says little about how contributions should be balanced across different countries to meet its goals. In this post I’ll focus on one indicator: per capita emissions, both now and cumulatively. Countries with higher per capita emissions should, other things being equal, have a greater obligation to reduce emissions. Clearly other criteria, such as income and abatement opportunities, also affect an appropriate distribution of obligations under NDCs, but I’ll ignore these for now. Per capita emissions vary enormously between countries – not just between developed and developing countries, but also within these groups. Chart 1 shows per capita CO2 emissions for major economies since 1990. There are some striking differences. The worst performers are the USA and Australia, which now have around three times the per capita emissions of France and the UK. 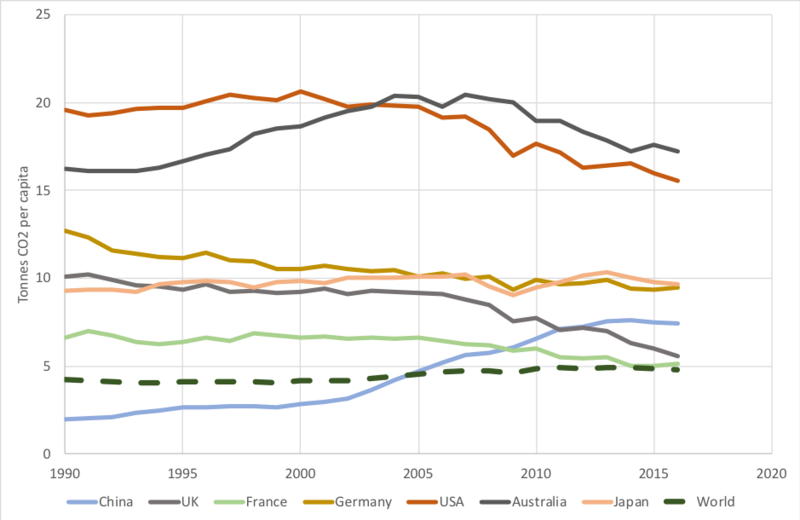 Germany and Japan’s emissions are lower than those in the USA or Australia, but well above French and UK levels, with no downward trend since 1990 for Japan. In contrast, France has had relatively low per capita emissions for many years, in large part due to a low carbon power sector, while the UK’s per capita emissions have fallen by some 40% since 1990. Both the UK and France are now quite close to the global average of 4.8 tonnes per capita. Meanwhile the distinction between developed and developing countries has become less clear-cut. Emissions from China have risen rapidly along with its economic development. Per capita emissions in China rose above those in France in 2009 and the UK in 2012. By 2016 they were 33% and 45% respectively above the UK and France. However they remain below those of Germany and Japan, and are still less than half the levels of the USA and Australia. Climate change depends on cumulative emissions rather than emissions in any one year. Equalising cumulative emissions per capita (that is cumulative emissions divided by cumulative population) in effect shares a fixed carbon budget equally across countries over time[i]. The calculation here looks at emissions and population since 1992[ii], the date at which the UNFCCC was adopted[iii]. At this point all countries committed to the objective of limiting dangerous anthropogenic interference with the climate[iv] (more on this choice of period below). On this basis even the best performing large developed economies, France and the UK, have higher cumulative emissions than China. However the difference is now reducing as China’s per capita emissions have risen. This trend may continue. The UK has a legally binding commitment under its Climate Change Act to reducing emissions by 80% from 1990 levels by 2050. France faces similar targets as part of the EU’s commitment to reduce emissions by 80-95% from 1990 levels. They will all then, under the Paris Agreement, need to reduce emissions to zero in the second half of the century. This raises the question of what emissions track would lead to China having the same cumulative emissions as major developed economies by 2050, or after. The scenario shown for China in Chart 2a is based on eventually equalling the UK’s cumulative emissions, assuming the UK meets its own targets. This convergence is shown in Chart 2b. The UK is chosen as a representative developed economy which is performing well in emissions reductions. Lower emissions than this would be required to match cumulative emissions from France. Higher emissions would be possible to equal Japan’s or Germany’s (not shown on chart 2a). Under this scenario China decreases its emissions to about half current levels by 2050. With China on the track shown the world would, provided other countries matched it, have a good change of limiting global temperature rises to below 2 degrees, though not 1.5 degrees. Note: emissions track for France is indicative and depends on EU burden sharing. 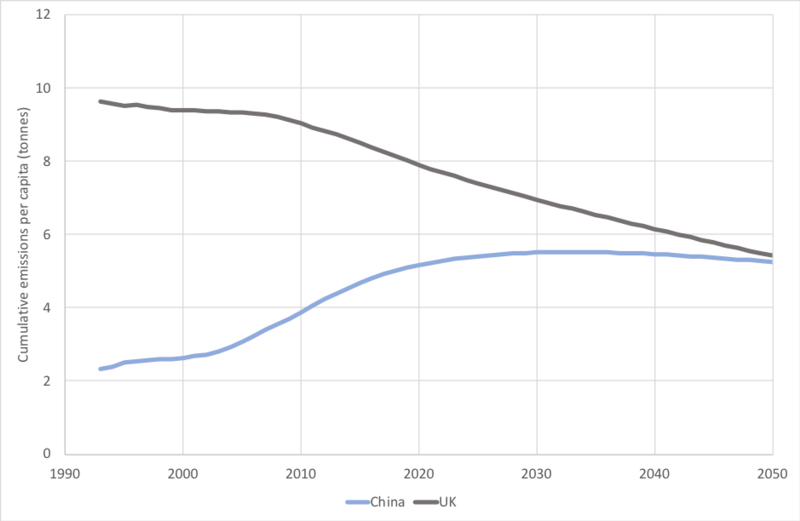 Note: Cumulative per capita emissions for China remain slightly below those for the UK in 2050 to allow for additional emissions after 2050 – China’s annual per capita emissions are still higher than the UK’s by 2050. What about going further back for cumulative emissions? These results are strongly dependent on taking into account emissions over the last 25 years, since the UNFCCC was adopted. 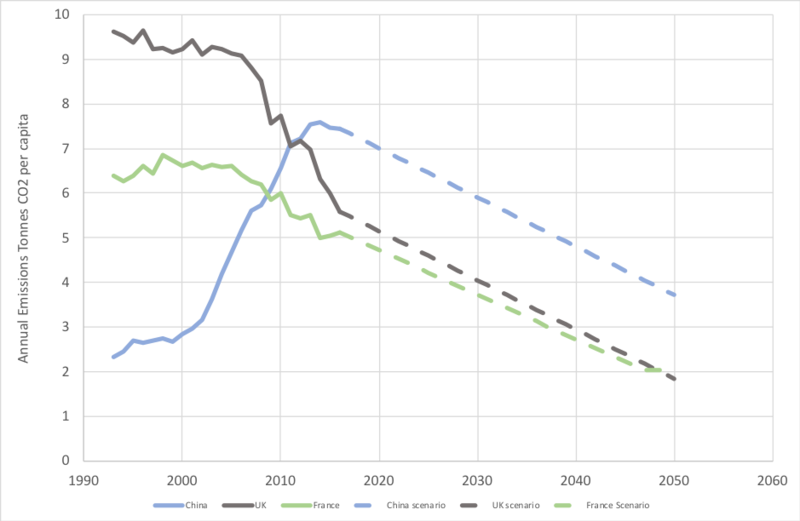 The longer the time period, the greater China’s future emissions (and other countries) can be while still retaining cumulative emissions below those of developed countries. Indeed, some favour counting all emissions over time, going back centuries, or at least to the beginning of industrialisation. They argue that countries are responsible for all their historic emissions, in part because developed countries are now benefiting from past emissions, which allowed them to build their economies. However, going this far back this seems to me inappropriate on a number of grounds. Many of these emissions will have been from actions of people living long ago, with no knowledge of the harm they were causing. It does not, for example, seem appropriate to put obligations on current US citizens due to actions of US citizens in the 1920s driving model T Fords. Not all past emissions have benefitted current citizens, and not all were under their control. For example, emissions from Eastern Europe in the Communist era (from 1945 to around 1989) were notably inefficient and unproductive. Benefits of past emissions have gone beyond the emitting countries, to include citizens of developing countries. China’s extraordinary growth in the past three decades would not have been possible without learning from developed countries, so it has benefitted from the same historic emissions that enabled developed countries to reach their present state. Countries developing now have opportunities to follow low emissions pathways not available to those that developed earlier, whereas those developing earlier may have infrastructure which gives a certain amount of emissions lock-in. These arguments suggest, among other things, that cumulative emissions should not be used as a proxy for wealth, capability or opportunity, which should be considered separately. In any case, allowing all countries to reach cumulative emissions to equal those of developed countries over all time would be incompatible with the commitments of the Paris Agreement. It is therefore not a suitable basis for action. China, as the largest emitter in absolute terms, has a unique role in determining the success of efforts to avoid dangerous climate change. Emissions need to head rapidly downwards to at most half current levels by mid-century to match cumulative emissions since 1992 of the better performing developed countries, and to achieve the goals of the Paris Agreement. It will be of tremendous benefit to the world if China can achieve this. This implies there is an opportunity for China to show strong leadership. But this window is closing rapidly. Meanwhile, leadership from the USA (at the national level) and from Australia, and to a lesser extent from Germany and Japan, remains disgracefully lacking. [ii] This approach has previously been applied by Ekholm and Lindroos (2015) https://www.vtt.fi/inf/julkaisut/muut/2015/VTT-R-00139-15.pdf, although the author used 1990 as the start date rather than 1993 as here. [iii] The UNFCCC was adopted on 9 May 1992 and opened for signature at the Earth Summit in Rio de Janeiro from 3 to 14 June 1992. It entered into force on 21 March 1994, after enough countries had ratified it. [iv] Article 2 sets out the objective of stabilization of greenhouse gas concentrations in the atmosphere at a level that would prevent dangerous anthropogenic interference with the climate system. This entry was posted in Climate change policy on 26/11/2018 by adamwhitmore.